childhood, pavement chalk drawing, Vancouver B.C. They grow up so quickly don’t they? Overhead view of the colourful birthday announcement written in chalk on the pavement of Tupper Street. 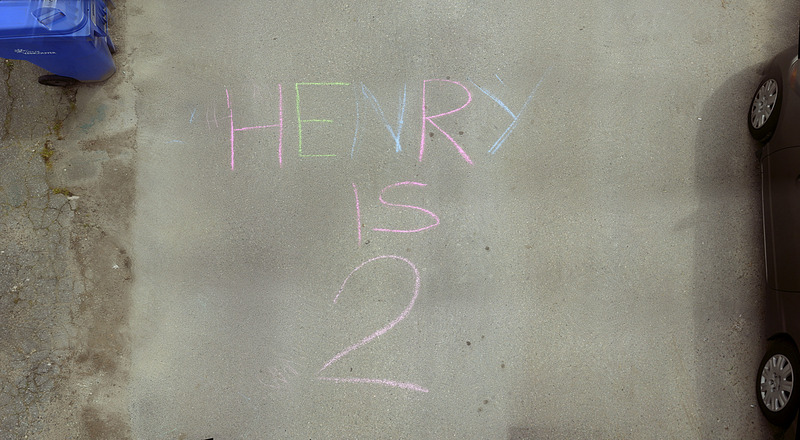 Obviously we have to chalk up this written announcement to the proud parents, I think, rather than to Henry himself. After all, it’s unlikely that a tyke just entering the terrible twos would either be so literate or have such legible penmanship. Personally, I would’ve just eaten the chalk when I was that age. Oops! This was supposed to be all about celebrating this sweet little kid’s birthday and there I go again, making it all about me. My bad. Sorry everyone. Sorry Henry. Click the image to enlarge it. The tyke must be proud to use two fingers now instead of one. Parents must be proud us. Great find! « Bugs—we know them when we see them, right?